Welcome to the Yoga Circles site! Yoga Circles is a guide to creating small communities of yogis. My goal is to inspire people who love yoga to join other seekers in person and online to share our experiences as students, teachers, and devotees of the practice. In short, let’s support each other on this journey! Get your copy of Yoga Circles now! Yoga classes inspire me with endless topics to talk and write about. I’ll chat with teachers or students for a few minutes after class, but it seems there’s never enough time to share. We all have places to go and things to do when class ends. I wrote Yoga Circles because I wanted to gather with a group of yoga friends outside of class to talk more, experience more, socialize, and live our yoga together. I’d been part of discussion groups and book groups before, so I knew even though my goal was to create a space for informal, fun gatherings, there had to be some kind of plan. I looked for a guide but couldn’t find one. So I wrote one! I didn’t want Yoga Circles to come from my viewpoint alone. I wanted to include other people’s stories of transformation through the practice as well. So I asked some yogi friends, clients, and colleagues to contribute stories. I’ve been blessed with contributions and continue to welcome them. If you’re a yogi who loves to write, I’d be honored to have you as a guest blogger here on the Yoga Circles site! Your story may also appear in a future edition of the book. Would you like a free excerpt of the book? Click here! In the fall of 2016, I began building this site. I decided to set a publication date for the book. As soon as I chose the date, a small voice told me, “You’ll never pull it off!” (I still had a lot of writing and editing to do.) But my yoga and the wise words of a teacher who had no idea I’d decided to do this intervened. I didn’t know if I’d reach the goal, be we yogis are flexible, so I forged ahead. And guess what? I was able to publish Yoga Circles even sooner than I’d hoped! But this is just the beginning. Coming soon is an online community of virtual Yoga Circles, and I hope, many in-person circles, perhaps one near you! Hi, I’m Maria! 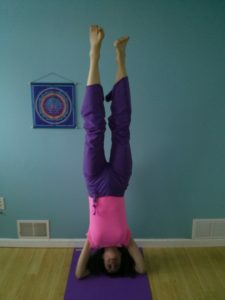 (That’s me upside-down in my home yoga studio.) I’m a writer, editor, and content marketing creator. My niche is well-being, but I have experience in technology, education, and business as well. I help yoga teachers and studio owners, health coaches, nutritionists, and other wellness brands share their amazing offerings and gather clients, customers, and students. My work includes writing and ghostwriting blogs, web content, and books, as well social media management and assistance. I also provide editorial and basic design services for nonfiction authors. I work with authors of self help and inspirational books, creative nonfiction, and memoir. Yoga Circles is my offering to you. I hope it will help you connect with others (and with me). If we can live our yoga in community, we transform the world one group of yoga friends at a time. Yoga changes lives, as you know if you’re a seasoned yogi. If you’re just starting to practice or have never stepped onto a yoga mat before, I invite you to join us and find out exactly how yoga works its magic. Check out the Yoga Circles blog for more inspiration, and contact me anytime. I’d love to hear from you! If you’d like to contribute a story, please contact me. Or just drop me a line if you’d simply like to learn more about the project!